There can be more than one book in a volume, but I can only choose 10 volumes plus a book of national importance to my culture and one religious book. My previous choices in these categories were the Icelandic Sagas and the Mahabaratha in 2008, and in 2011 I again chose the Sagas and the religious book was the Koran. My culturally important book for 2014 is yet again the Sagas (I have read one of them since last time), and the religious book would not be a book of religion (like the Bible or the Koran) but one about religion or the lack thereof - title not decided yet but God: A Biography by Jack Miles comes to mind. The Oxford Companion to the English Language. Grammar and literary history in one neat package. Gone With the Wind by Margaret Mitchell. For some drama and romance. One of my Discworld omnibuses, probably the one containing Pyramids, Small Gods and Hogfather or maybe the one containing the first three City Watch books. For some humour and to have reliable fall-backs if I don’t like the ones I haven’t read yet. Shadow of the Wind by Carlos Ruiz Zafón. I keep meaning to read it. The Iceland’s Bell trilogy by Halldór Laxness (I’ll have to hand bind them into one volume since I don’t think there is an omnibus edition available). I thoroughly enjoyed the first book and think it is time to reread it and read the others. Sögur íslenskra kvenna 1879-1960. This is a volume that I keep intending to read and keep putting off because it’s such a large book. It contains a number of short stories and some short novels written by Icelandic women. Kristin Lavransdatter by Sigrid Undset. The Icelandic translation because I don’t fancy having to take a Norwegian dictionary as one of my books. Don Quixote by Cervantes. Another big book, one I have been intending to read for the last 15 years or so. An English translation, critical edition. Voyage of the Beagle by Charles Darwin. I figured I had to bring one work of non-fiction and this has been on my TBR list for a long time. If I could smuggle in one more book, it would be The Norton Anthology of English Literature (one-volume of it). I first thought to include Dalalíf by Guðrún frá Lundi (a long historical novel), as in the previous two lists, but after making my first draft of the list I found a copy of the first volume and started reading it and decided that I didn’t really want to finish it. Therefore the Sagas are the only book on all three lists. Instead of Dalalíf I chose The Mists of Avalon by Marion Zimmer Bradley. If I had to replace the Sagas, I would choose a Tómas Guðmundsson poetry anthology or a Jónas Hallgrímsson prose anthology. The Norton Anthology which I almost included on this year’s list was not on the 2011 list but was included in the 2008 list. Same goes for Small Gods, plus there is an unspecified Terry Pratchett omnibus on the 2011 list. Two books that were on both previous lists did not make the grade this time: The Once and Future King by T.H. 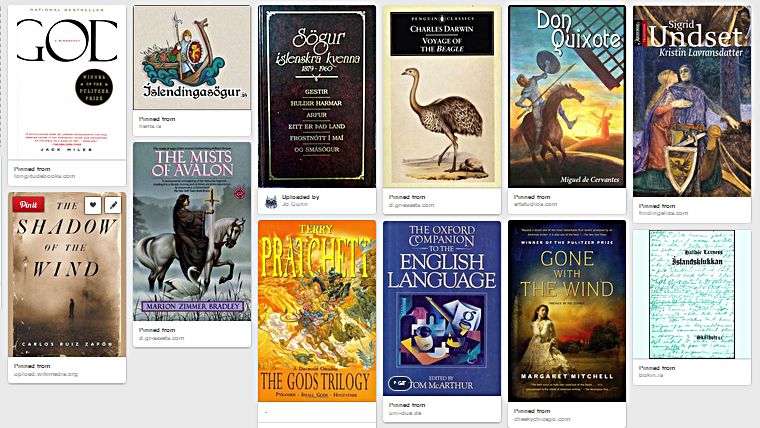 White (one Arthurian novel is enough, I think), and The Arabian Nights. Both might reappear on the next version of the list. I have only finished one of the previously listed books that I had not read before: London, the Biography. Pitiful, I know, but my interest fluctuates and new books come into orbit all the time. So, Dear reader, do you have a current list of desert island books?